HTML5 has won the war with Adobe Flash for mobile devices. As of today, Flash for Android devices won’t available to download anymore from the Google Play store and the company said it has stopped development of Flash for mobile devices. Adobe delisted Flash Player from Google Play, and you won’t be able to get any updates that fix bugs unless you have a device with Flash already installed or pre-installed by the manufacturer (here’s a list of the Flash-certified Android devices). In other words, Adobe is telling everyone to move on from Flash on their phones. If you have an Android 4.1 Jelly Bean phone, then Adobe says Flash Player is not supported. If you had Flash preinstalled and updated to 4.1, the company recommends you uninstall Flash, as it is not certified and could “exhibit unpredictable behavior.” If you have a Nexus 7, then the tablet does not come with Flash pre-installed, and the new Chrome browser does not support Flash anyway. Some popular video providers have not transitioned to HTML5, so if you still want Flash on your phone, there are ways around it -- just keep in mind that this is not recommended by Adobe and that the experience with the plugin can be very poor. Also note that downloading the Flash Player apk file from unofficial sources could open the gates to malware on your phone or tablet, so it’s not recommended to get the file from third-party sources. The best source to download a working official version of Flash player is from Adobe’s own site. Once you downloaded the apk file, you can just sideload it to your device with a service such as APKinstall. However, these files are aimed at developers, so installations made from the archive will not receive updates through the Google Play Store (until September 2013, Adobe says). Despite its best efforts, Flash for Android devices never delivered a seamless user experience. Many users experienced choppy playback and in some cases it sucked battery life down. However, the plugin is installed on more than 100 million Android devices, according to Google Play Stats, and it has 4.3 stars as an average rating. With Flash for Android’s demise, there’s no excuse left for content providers that didn’t adopt HTML 5 video yet (yes, that’s you “The Daily Show”). iOS notoriously did not support Flash from day one, neither did Windows Phone, and development for BlackBerry and Symbian versions is also ceasing. Soon, besides PCs, there’s won’t be any room left for Flash -- but even there, Windows 8 will have limited Flash support. So sooner or later, everyone will have to move on. Will you miss Flash for Android? Sound off in the comments. 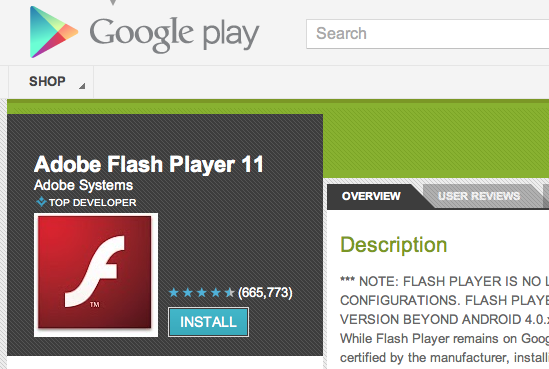 This story, "Android Flash Player RIP: How to Get it Now That it's Gone" was originally published by TechHive.